VecTor5 is a nonlinear finite element analysis program for two-dimensional frame structures consisting of beams, columns and shear walls, subjected to thermal, quasi-static (monotonic, cyclic and reversed-cyclic) and dynamic (seismic, impact and blast) loads. Auxiliary program FormWorks+ allows users to create their analysis models in a graphical environment, while program Janus displays the analysis results including deflected shapes, crack patterns, concrete and rebar stress contours, failure modes, and so on. 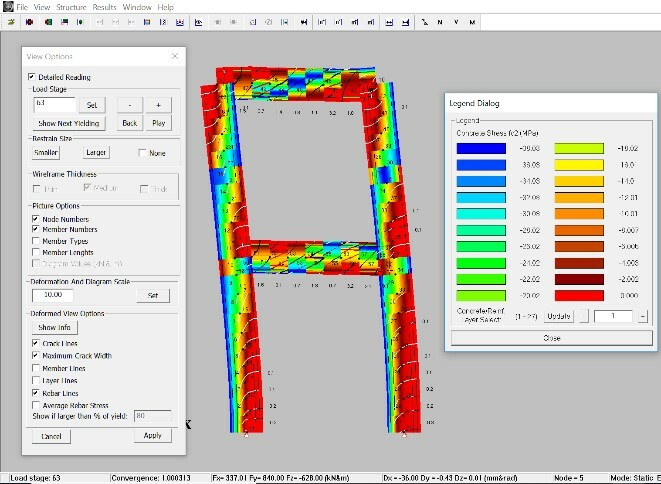 VecTor5 allows the analysis of frames with unusual or complex cross-sections and considers significant second-order mechanisms to accurately represent the behaviour of cracked reinforced concrete structures. The compression softening due to transverse cracking, tension stiffening, shear slip along crack surfaces and out-of-plane confinement & expansion effects are explicitly considered. Displacement-controlled algorithms enable an analysis to continue after the peak load, capturing the post-peak response and the displacement ductility. The incorporated deep beam element (Liu et al. 2019) allows combining slender frame and deep beam elements to account for failures and post-peak behaviors associated with complex shear failures. The deep beam element uses a three-parameter kinematic model (Liu & Mihaylov 2018), based on the behavior of two fans (modeled by rotational springs) and a critical shear crack (modelled by a transverse spring). The included buckling model (Akkaya et al. 2019) enables capturing the buckling response of compression bars in concrete members while accounting for the interactions between the lateral ties and longitudinal bars. This model is capable of simulating the onset of inelastic buckling and subsequent degradation in the post-buckling region. VecTor5 employs six-degree-of-freedom fiber-section elements using a distributed-inelasticity algorithm, and an iterative, total-load, secant-stiffness formulation. The nonlinear sectional analyses provide a comprehensive and accurate representation of the concrete response, including the shear effects coupled with axial and flexural responses based on the Modified Compression Field Theory (Vecchio & Collins 1986) and the Disturbed Stress Field Model (Vecchio 2000). Compression-only, tension-only, and truss elements are also available to model various conditions (e.g., special supports, soil, brace elements, etc.). Nonlinear dynamic analysis algorithms employ an explicit three-parameter time integration method, allowing the use of Newmark’s average or linear acceleration, or Wilson’s theta methods. The effects of high strain rates on the material behavior are accounted for. Structural damping is provided by the nonlinear concrete and reinforcement hysteresis models (Guner & Vecchio 2011).